MORTIER -Partie Septentrionalo Des Pats qui sont situez entre le Rhein, la Saare, la Moselle, et la Basse Alsace. MORTIER, P. - Partie Septentrionalo Des Pats qui sont situez entre le Rhein, la Saare, la Moselle, et la Basse Alsace. Partie Septentrionalo Des Pats qui sont situez entre le Rhein, la Saare, la Moselle, et la Basse Alsace. - MORTIER, P.
Title : Partie Septentrionalo Des Pats qui sont situez entre le Rhein, la Saare, la Moselle, et la Basse Alsace..
Map maker : MORTIER, P.. Date : Amsterdam, c. 1700. Size : 36.0 x 24.5 inches. / 91.4 x 62.2 cm. Description :This vibrantly colorful map focuses on the Rhine River region in southern Germany and its tributaries, extending into France. The Rhine is illustrated in the center of the map with the Mozelle River extending off to the left. Also extending to the left is the Nahe River and the Main River to the right. A large compass rose is depicted in the center of the map, major cities are highlighted in red such as Kassel in west-central Germany, Munster in the northwest and Koblenz at the intersection of the Rhine and Mozelle Rivers. 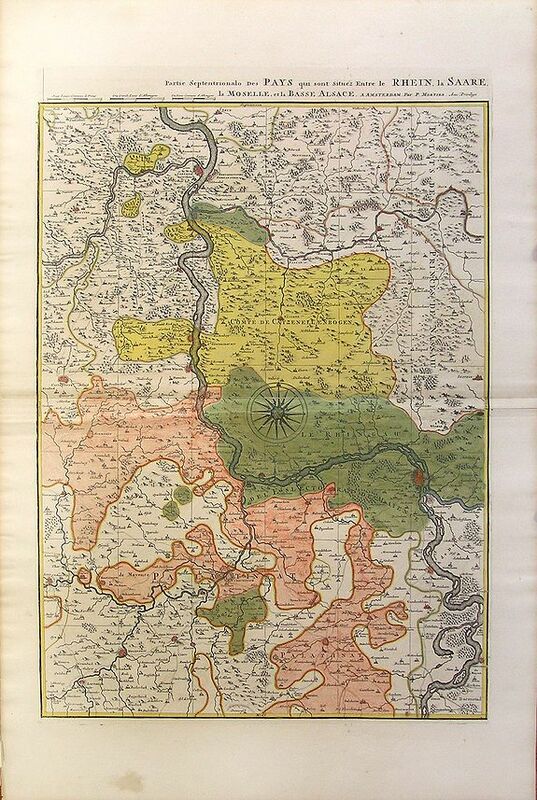 Colorful ribbons and shaded areas divide regions on the map, with excellent oxidization of the green color seen on the verso side. Condition : Light foxing throughout margin with light stain on lower margin. Slightly wrinkled and discolored edges.